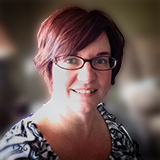 Posted in 52 Ancestors Challenge on June 12, 2015 by Amy Johnson Crow. Yes, this recap is a day later than usual. It has been an incredibly hectic week and a half. 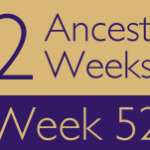 I did see some wonderful 52 Ancestors posts this past week, but honestly, I was too scatterbrained to bookmark them to highlight them in this week’s recap. Who Did You Write About? Who did you write about last week? 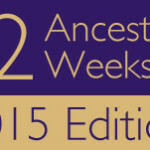 Leave a comment with a link and a little bit about your ancestor. And since the weather is so hot, crank up the A/C and read the posts from Week 22. Someone might have written about an ancestor of yours! Still able to go with the themes! My 2nd great-grandparents Mathias Pöppelreiter and Magdalena Wagener had only one child for whom I have a date of marriage and it was in June. I chose my parent’s wedding photo – and wrote about the 50th anniversaries in my family. My great-grandfather’s sister Anna Elizabeth Gatlin was married four times. Her last two husbands were also married multiple times. Taking care of your mother is what’s important Amy. Prayers for her continued recovery. Glad your mom is doing well! My cousin Gary Barlow guest blogs again this week about his ancestor, Anna of Kiev. Sorry about your mother, Amy. I empathize, as my mother-in-law was diagnosed a few weeks ago with pancreatic cancer, and I have been staying with her to help her deal with the news and her treatments. I am grateful to Gary Barlow for helping me out this week. David KASER (1853-1923), one of my father’s uncles, lived with his parents when he first married. His bride, 8 years younger than he, was pregnant. He was working as a carpenter, the first of many jobs he held. Although he had to work hard at whatever job he could get or invent in order to support his large family, he must have enjoyed the outlet of playing Tuba in the community band with many relatives. Not on Theme – somehow, I blocked on this theme! So here’s another direct ancestor, George HUDSON/HUTTSON, 1680-1748, from Wales to Caernarvon, Pennsylvania. I included a photo of the church where his children likely were married! I wrote about my parents wedding in 1937. Mary Bowman ASHBY, known as “Bowmie,” married Charles Chapin ADSIT in 1890 in Louisville, Kentucky. Not until I found this newspaper wedding announcement did I know more about their wedding. Amy, I too have been pre-occupied with family matters for the past week. Specifically my Dad, who may not be with us much longer. With that in mind, I posted my parent’s wedding photo and their story. RENFRO, John Marion (c. 1846 – 1916) – This is more exciting news about my polygamist great-great grandfather. Turns out he got caught. ANDREW, George Richardson – my mother was bridesmaid at her older brother George’s wedding in Toronto in 1945 just before the war ended. His bride was Marjorie June LEE. Couldn’t write about my 6 times married/partnered (including more than once to the same woman) cousin Kenna ’cause he’s still alive, so instead went with one of 2 great uncles who were both married 3 times. I wrote about my Grandfather’s Aunt, don’t know a lot about her but have a great wedding photo! EVERETT, Jack Ross – Jack married Antonia Flores in Mexico in 1847. He converted to Catholicism and married Antonia the very next day. I chose not one wedding but a line that did a lot of intermarrying for my post this week. ABBOTT, George (of Andover, MA) and his descendants. I wrote about my great grandmother’s weddings and how her perspective on life must have been very different at these two weddings. Prayers for your family Amy. I found out I don’t have any ancestors that I’m aware of that were married in June. I did find out that my parents had the Wedding March played on a vibraharp. A “shotgun” wedding? Not really but the photo is something else. Amy, I hope your Mom is still doing well. I wrote about my own wedding on Week #23. That I had one was a surprise to me. That it was so small was a surprise to my husband. I wrote about a proposal rather than a wedding. I was inspired by an interesting letter that had been uncovered in the family paperwork. I wrote about the wedding of my maternal grandparents, Daisy Morgan and Archie Fleming in 1932. 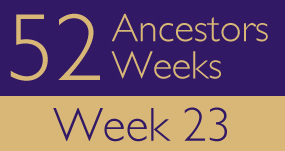 My 33rd wedding anniversary is approaching on 12 June; so I am highlighting those couples in my family tree whose wedding also occurred on 12 June. A search of my database revealed two couples who meet this criterion. So late… trying to catch up! Another one late at the party! An trip back in time, in New France’s 17th Century.